Tributes have been paid to Connor Aird, the second young man to die after an accident on the Standing Stane Road last weekend. The 17-year old passed away in the Western General Hospital, Edinburgh, on Friday night. He was a passenger in the car involved in the crash which claimed the life of Ethan King (17), with two others, including the driver, still in hospital. 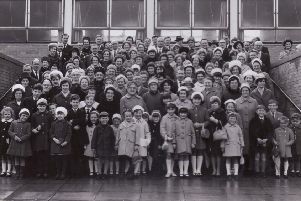 Derek Allan, rector at Kirkcaldy High School, where the youngsters studied, paid tribute. He continued: “He was one of the lads. and, like Ethan, he loved his football. “He formed many close bonds with his teachers and with other staff here, and they are heartbroken by this news. “He had a whole life ahead of him he’ll be remembered in his school. “I will always recall Connor as a bright, bubbly laddie, keen on the banter. The news of Connor’s death came just hours before a huge tribute event takes place in Kirkcaldy. The memorial for Ethan, is expected to up to 1000 people to the waterfront in Kirkcaldy, where candles will be placed along the sea wall. It takes place at 6.00pm. An online fundraiser has now generated almost £10,000 to help the youngster’s family, and there are collecting cans in many venues around town, while friends are auctioning football shirts to generate further funds. Inquiries into the collision are ongoing and officers continue to appeal to anyone who saw the black Vauxhall Corsa travelling in the area prior to the collision, to get in touch. Those with information can contact Fife’s Road Policing Unit via 101, quoting incident number 1257 of 11 November.